Samuel Anderson, the Surgeon on board the ship Delaware, witnessed the yellow fever epidemic while staying in Curaçoa. 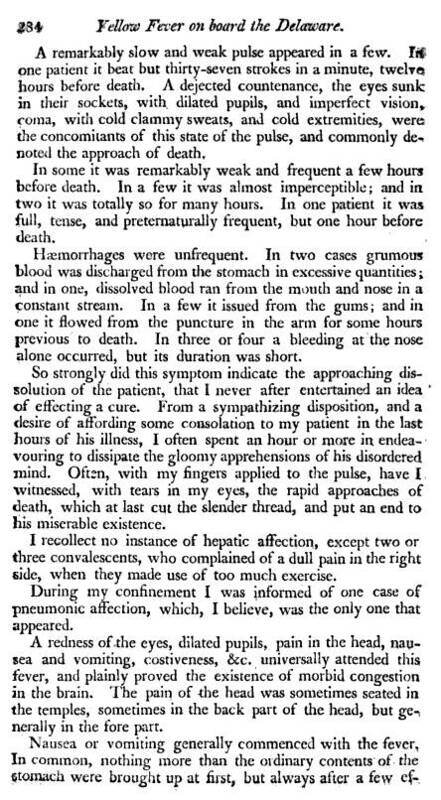 This epidemic lasted from November 1799 to February 1800. 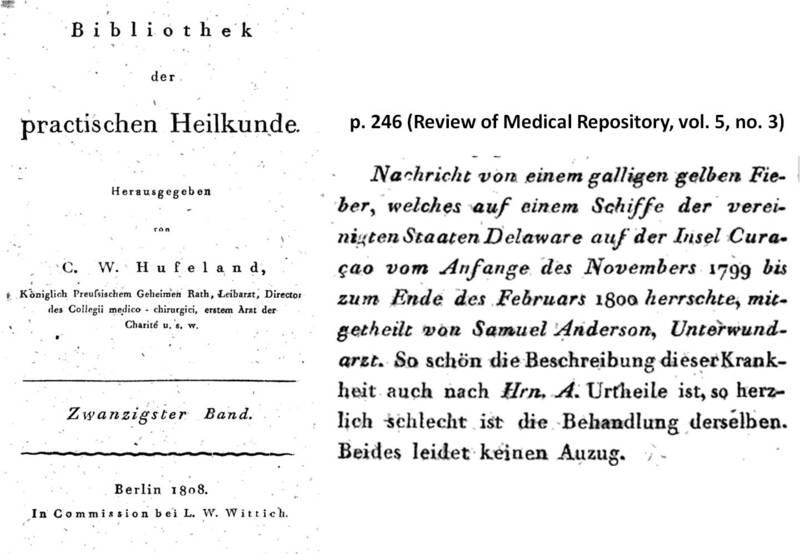 His work in attempting to uncover the cause for this epidemic that often struck the United States is detailed briefly in this short note published in this German journal on medicine edited by C.W. Hufeland. Hufeland ultimately became one of the chief promotors of homeopathy worldwide and was the primary reason the profession invented by Samuel Hahnemann later became such as success. Often it was the failure of regular medicine during these trying periods of recurring epidemics that caused new theories for disease to be proposed and alternative forms of medicine like homeopathy to develop such a strong following. For a brief wikipedia biography see http://en.wikipedia.org/wiki/Samuel_Anderson_(politician). Like many doctors of the 18th and early 19th centuries, a sure step to becoming a successful physician was to learn your skills as a Surgeon’s Mate on board one of the U.S. vessels. To accomplish such a manner of training was one step above the simple apprenticeship engaged in on the main land. 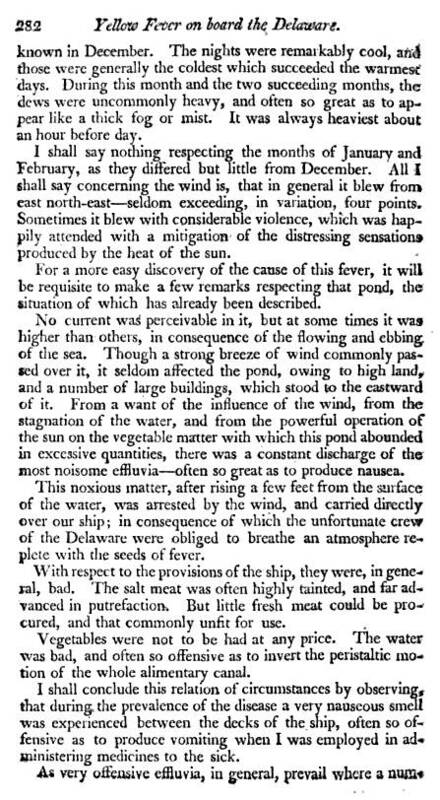 As a ship surgeon one had to contend with more illnesses than the typical countryside, epidemics that could become completely fatal due to the small quarters of a vessel at sea with little or no escape, unusual diseases from other countries, diseases from climate and environmental settings never before experienced by the people you grew up with. The sailor was typically a victim of poor foodstores, poor water supplies, rancid, putrid living and work conditions, and exposure to the greatest variety and worst forms of the natural elements considered responsible for disease due to nature. The ship surgeon and mate were just one step above the sailor in many ways when it came to the day to day living experience. The surgeon and mate had a little more of a knowledge base than the sailor, or even captain when it came to disease prevention. The best ship surgeons were well read in the classical discoveries of Lind for example, and therefore able to prevent such common diseases as beri beri and scurvy brought on by malnutrition. They usually knew enough or heard enough about the lues venera spread by young women residing in foreign countries, about the new guinea worm and its dreaded effect upon the flesh, the elephantiasis and yaws experienced by inhabitants of certain tropical settings. 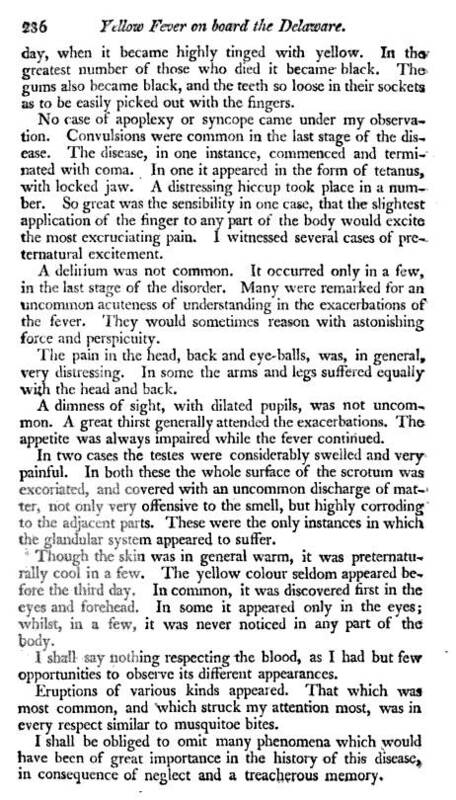 When the fever came on board a ship from the tropics, it was typically a result of the warm climate and the tiring effect this had upon the human physique and energy levels. Some fevers were almost always associated with bad waters and corrupt food supplies. Others were due to some ongoing diarrhea or dysentery that came about as the result of spending too many nighttime hours in a foreign urban setting. The yellow fever was unique in how it caused people to rapidly deteriorate and quite often die. Unlike the malaria, it lacked the periodic on and off of the high temperatures seen for these victims. Unlike the spotted fever (typhus) infrequent at sea except during the colder period, yellow fever was most common during the hottest months of the year, as the summer headed into the autumnal period. September and October were usually when yellow fever took most of its victims, with this date appearing as though it was migrating from the edge of the tropics into the temperate parts of the earth as the last weeks of July passed, leading into August, enabling the epidemic to reach North America by September usually, and taking most of its more northern victims during the month of October, before suddenly stopping some time usually between October 15th and October 30th. The big argument during this time in the medical profession was did yellow fever erupt locally due to local environmental features? Was it imported by ship? Since many of its earliest victims were associated with those ships, was it the change in their living settings, particularly climate, that was the cause? Could their residency on board a ship, preceded by residency in some foreign land be the cause? 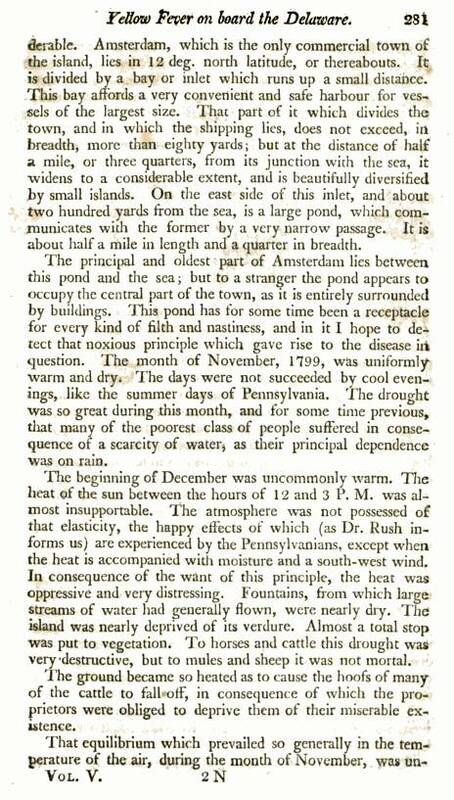 Were they of weak temperament, or poorly acclimated and unable to adapt to these changes in seasonal conditions? Were they sick due to poor nutrition? reckless drinking and eating habits? habitual gambling practices on board along with excessive drinking of Madiera Wine or Rum purchased from the Barbadoes? Samuel Anderson’s (1773-1850) life experience included his exposure to these kinds of questions. He served on board first as a surgeon’s mate equivalent, although there was no surgeon on board then, followed by his advancement to actual surgeon’s status due to his successful work on board. These experiences happened during a period of serious political unrest at sea. The Revolutionary War was over, the War of 1812 still a decade or more away, but still, there was the problem of pirating at sea and the possibilty of losing a ship during some brief battle, a large storm at sea, or the result of a confrontation with another country’s unwelcoming man-of-war. This period of military activity at sea was referred to as the quasi-war period. During this time an ambassador to the U.S. would be killed, due primarily to financial unrest and the failing British economy and export industries. But none of this led to any movements taken by either side to reinitiate a battle between the U.S. and Great Britain. (See my coverage on the Woollen Laws for more on this.). It took another 5 or 6 years for hostilities to commence enough to consider them war-related events, and even thereafter, the pseudo-war of 1812 actually took from 1812 to 1815 to take place, even then never having any well defined borders where effective offenses took place. A good defense is all that was necessary this time through. From his biographies, we learn some more essential facts about his life before during and after his yellow fever experience. Samuel Anderson learned medicine beginning some time around 1794 or 1795. He completed his training in 1796. Samuel Anderson’s service at sea as a surgeon began in 1799 as an assistant surgeon. In 1800, he was assigned a full ship surgeon’s position. He is unique in the field of medicine due to his experiences at both ends of the route travelled between the Carribean and northern United States. 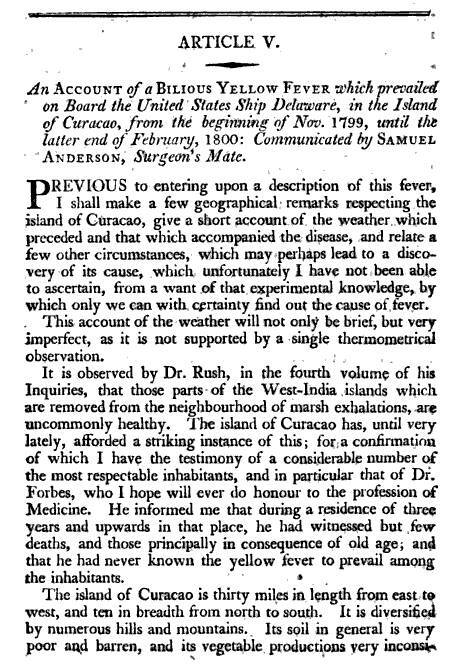 Whereas Rush and others discussed the diffusion of yellow fever based primarily upon their local experiences, Anderson had observations that he based upon his direct observations on board the ships and docked within the southern ports. 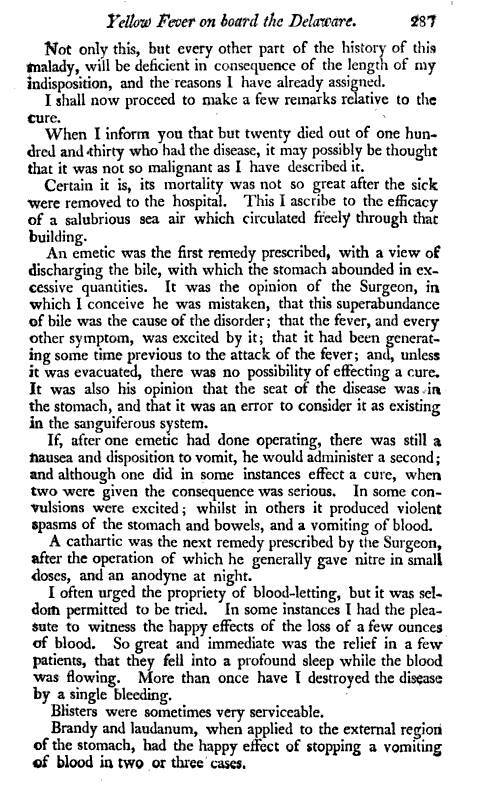 This helped quell some of the errors being propagated by those experienced with just the local events, blaming the disease on a large variety of causes ranging from stinking ballast from afar being released into the vicinity to the rotting flesh of marine animals and seaweed or the effluvium emitted by left over slaughterhouse remains or the strong stench of rotting, half roasted coffee beans. Those favoring the “local theory” for yellow fever, meaning they believed it be purely of local origins, were making equally unjust claims as those favoring the hypothesis that yellow fever was of foreign origin. Anderson’s experience and writings seemed to favor the latter, although without the realization that “muskeetos” could be the origin, Anderson like others was left proposing theories that were one step closer to the final word but not completely correct. Following his service to the Navy, Anderson went back to practicing medicine in Chester, Pennsylvania from 1801 to 1814. When the War of 1812 began, he helped raise a small army of volunteers known as the Mifflin Guards. In 1814, he received a commission as Captain for his efforts and service. Following the War, he was elected into the Pennsylvania House of Representatives where he served from 1815 to 1818. He took leave and served as a Sheriff for Delaware County, Pa., from 1819 to 1823, when he again entered into service as a surgeon for the Navy. Following his second round of service as ship surgeon to the Navy, Samuel Anderson resigned and ran for a position in the U.S. House of Representatives, and was elected. From 1823 to 1825 he served in the US House of Representatives, continuing his life in politics for his remaining years. (For biographies, see http://bioguide.congress.gov/scripts/biodisplay.pl?index=A000231, http://en.wikipedia.org/wiki/Samuel_Anderson_(politician)). The USS Delaware is reviewed briefly at http://en.wikipedia.org/wiki/USS_Delaware_(1798). The USS Constellation, a frigate. 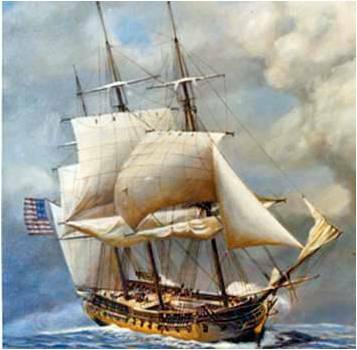 The USS Delaware, of similar size and shape, served alongside the USS Constellation during the Quasi-War Years of 1799 to 1801.